Charla Nash, the 55-year-old woman who was attacked by a 200-pound chimpanzee last February, is now blind, and doctors say she will need at least two years of surgery. The investigation into the attack is also ongoing, as police in Stamford, Conn. delve into what happened the day her friend, chimp owner Sandra Herold, called 9-1-1 screaming, "He ripped her face off!" The savage, 12-minute attack on Nash by Herold's beloved chimp, Travis, left Nash's face and hands extensively damaged. 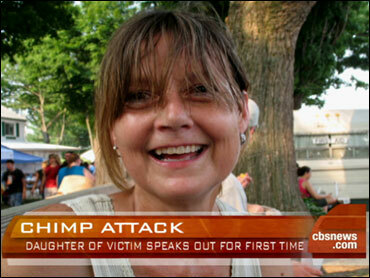 The chimp was shot and killed by police. Now, for the first time since the attack, Nash's 17-year-old daughter, Briana Nash, is speaking out about her mother's recovery. "I was just kind of in shock," she told CBS News correspondent Priya David. "I had no idea what to say. I wasn't really sure if whether it was OK to touch her or anything." But she added, with a wide smile, her mom not only recognized her, but said her name. Charla Nash's twin brother, Michael Nash, says the attack has left his sister dependent on others, completely changing her life. He said, "Charlie is very independent, and self-reliant, and she won't have that, ever." Priya says Nash has brain damage, as well, and refuses to believe that her injuries are severe, and that she was even attacked by Travis. Police say toxicology tests show Travis was drugged with Xanax, despite Herold's differing accounts since the attack. "Sandra did not have a prescription for it," Stamford police Capt. Richard Conklin said. "It looks like third-party Xanax, and certainly it's questionable whether she should have administered it to her pet." Herold could face criminal charges, in addition to a $50 million civil suit filed by Nash's family, which alleges, among other things, that she had given Travis medication that further upset the animal. Herold owned the 14-year-old chimp nearly all its life, dressed the animal and fed it human foods. When he was younger, Travis starred in TV commercials for Old Navy and Coca-Cola, made an appearance on the "Maury Povich Show" and took part in a television pilot. David also reports that the chimp's necropsy showed two substantial knife wounds to the back, confirming Herold's account that she stabbed her pet with a butcher knife in an effort to rescue her friend. Conklin says police will meet with experts in coming weeks to try to determine if the level of Xanax found would affect the chimpanzee's behavior. "It doesn't look like a large amount (of Xanax)," Conklin said. "They just have more frequent and severe outbursts," Coccaro said. He said he did not know how Xanax might affect a chimpanzee. April Truitt, who runs the Primate Rescue Center in Kentucky, said she's heard of private primate owners giving valium to their animals. "It's been well known in primate circles that giving valium to monkeys and apes, particularly if their adrenaline is up, can have a very different effect and not be sedating," Truitt said. Truitt said she did not know of any cases involving an owner giving Xanax to a chimpanzee. "It's never occurred to us to try," Truitt said. "What an awful postscript to this whole thing."